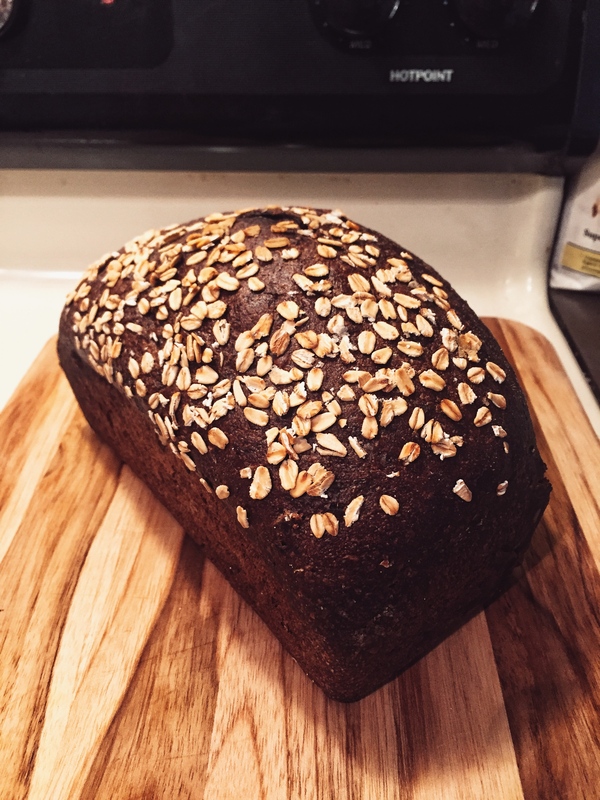 Pumpernickel is a heavy, slightly sweet bread made with rye. It’s soft and tender, and perfect for winter weather. Even though traditional German style Pumpernickel contains no coloring agents, and during baking, a process known as the Maillard reaction produces the deep brown color, sweet, dark chocolate, coffee flavor, and earthy aroma that Pumpernickel is known for. But in order to achieve this, the loaves have to be baked in long narrow covered pans for 16 to 24 hours in a super low-temperature (about 120 °C or 250 °F) and allow the steam to slowly cook it in the oven. If you want to check it out, the Youtube channel Great Big Story made a video called Baking Bread with Lava in Iceland, talking about a similar tradition in Iceland. However, what we are making today is a much easier version of it with almost a very similar flavor and texture profile, with the addition of wheat flour, at a higher baking temperature, and a dramatically shortened baking time. Place the dough onto a lightly floured surface and knead until smooth and it springs back to the touch, it takes about 8 to 10 minutes. Then transfer the dough to a buttered bowl and cover with plastic wrap. Let the dough rise at room temperature until it doubles in size, about 1 to 1.5 hour. Pat the dough down, then place it in a lightly butter a loaf pan, and cover it an let it rises for another 3o min. When the dough is at its final rise, preheat the oven to 190°C or 375°F. Then bake the pumpernickel bread for about 35 minutes, until the crust is dark brown. Let the bread sit for more 10 minutes outside the oven in the loaf pan, then carefully remove the bread from the loaf pan and let cool completely (1 hour or longer). Optional: I like to sprinkle on some rolled oats before baking to add a nice crunch on the crust. You can add almost any crushed nuts into the dough but always soak them in water before adding them, to the dough.